Great find!! I can see them white, maybe with a pattern inset on the top (Chevron maybe?). Love the tables. The lamp looks great there. Can't wait to see what color you paint them. the lamp will look great with those tables!! way to go!! Girl, you make me laugh with all your rap songs. Glad I am not the only one jamming to rap all the time! Great find in the Nesting Tables! I can never find anything on Craigslist, I am so jealous of everyone's finds! Going to go check out your guest post now! i don't know but it's enough to break the ice. i like the idea of white, but i also would love to see them in a glossy bold color like yellow or green or that dark blue you do so well... or summery dark coral! i am painting a table that color right now for a client and loving it! love the rap! too funny. Love the tables too! I think distressed white. Where are they? your living room? What a great deal! The lamp will look awesome there! Danielle- in that picture, they're against a wall in my breakfast room. But the tables will eventually go along the plantation blind window wall in my living room (in between the slipper chairs). Gah, I never find stuff on Craigslist .. Maybe I'm not patient enough?! Can't wait to see what you do with those cuties! Oh and now I have that Outkast song in my head! haha! I actually think the tables look lovely in their current state (at least in the photo). Otherwise, I say just stick with your style -- It's wonderful, and it works! Please, please, pretty please don't destroy these pieces with chevron striping or another overdone pattern (like Greek key). I really enjoy those uber-trendy patterns, too, but I think they're best left to accessories or other items that are easily changed out ... Just my two cents, of course! I'm sure whatever you come up with will be fabulous! I think these pieces could handle some color. And they are technically an accent piece which would still be following your rules, neutral slate with accent color. I always lean towards blue, since I think every room should have some blue in it. Love the tables!! They are gonna look fabulous! SUCH a great find! They're going to be amazing! 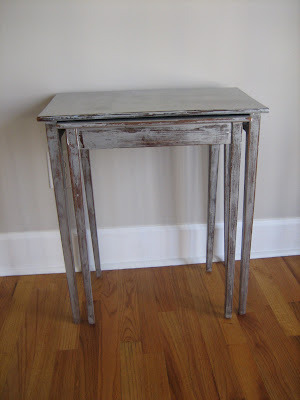 Looove those tables!! I LOVE a good score on craigslist! :) Can't wait to see what you end up doing with them! Those are amazing!! Great find! Can't wait to see the finished project! Super cute! I am a white girl but it depends on where they are going... what about a soft grey?? I enjoyed your post over at Danielle's today too! I kind of like them silvery! I think they would also look sharp as black! Great find! Can't wait to see how they turn out with a new coat of paint on them!